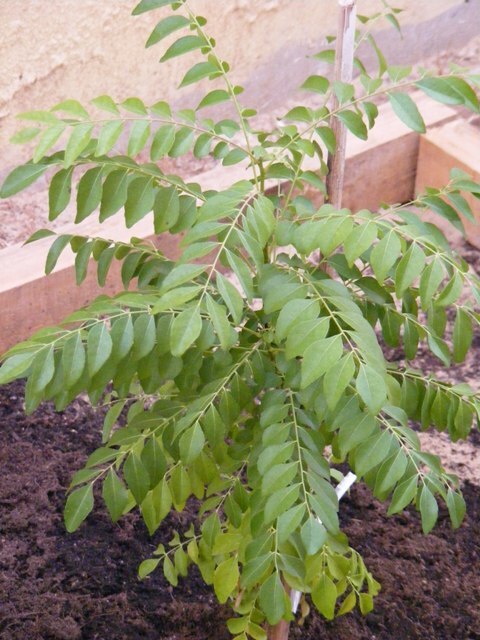 I read somewhere ” To plant a seed is to have hope in tomorrow.” I don’t know how long, we may stay in this house ~ but I know, if any of our trees survive, it will be a source of joy for the next tenant. I may not be able to enjoy the fruits of the tree but atleast, its something positive and fruitful that I left in this world where greed and consumerism has been a major cause for mass deforestation. We have a lovely narrow patch in the backyard right behind my kitchen, part of which was being used as my DIY work area ( more like dumping ground !! ) with loads and loads of wooden planks, pallets stacked up and paint cans everywhere. 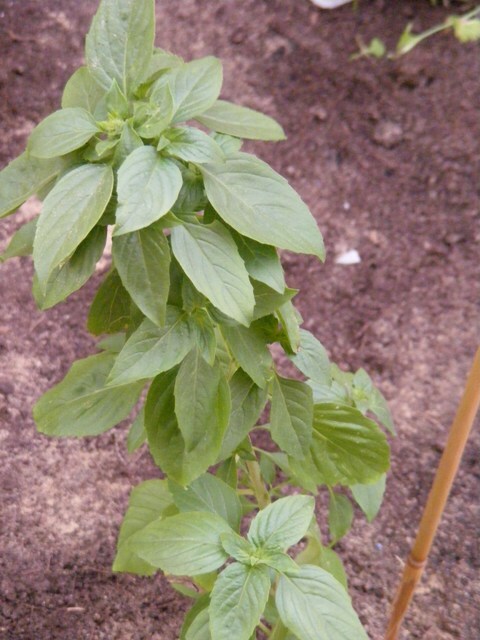 In all my previous homes, we grew all the herbs in pots but this year, I decided to be more adventurous ~ why adventurous ? Becoz herbs don’t survive outdoors in the summer 😦 But I felt it was worth a try. We’ll see. 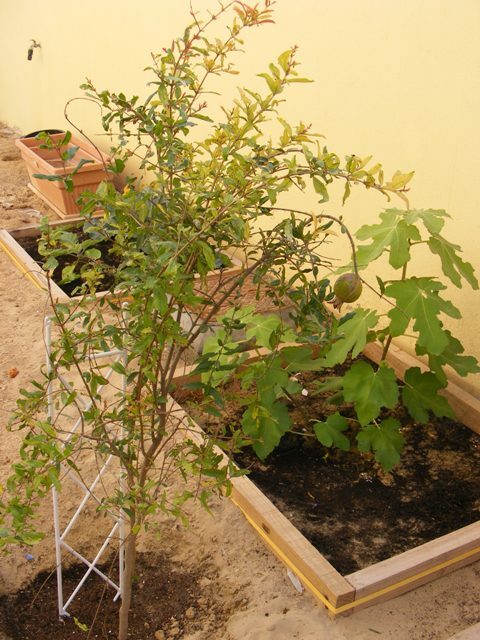 We also bought a few larger plants which will “hopefully” grow up to be trees such as Fig, lemon, pomergranate and Curry leaves plant. After clearing that patch, we decided to use the pallets, to make large rectangle frames. Three frames were laid next to eachother with a small gap in between. 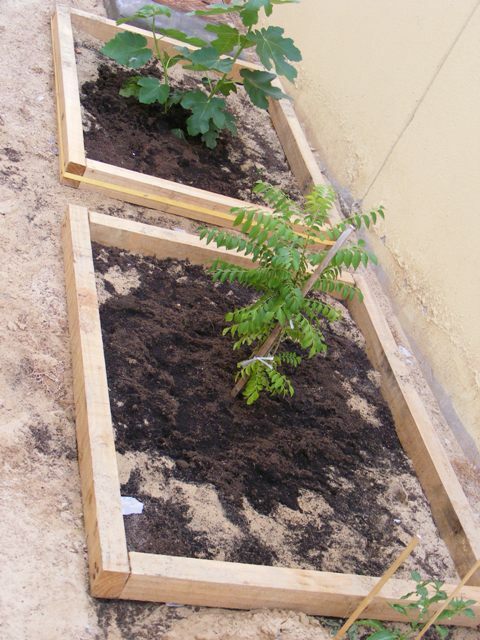 We then prepared the bed of soil and compost and later had the plants planted. 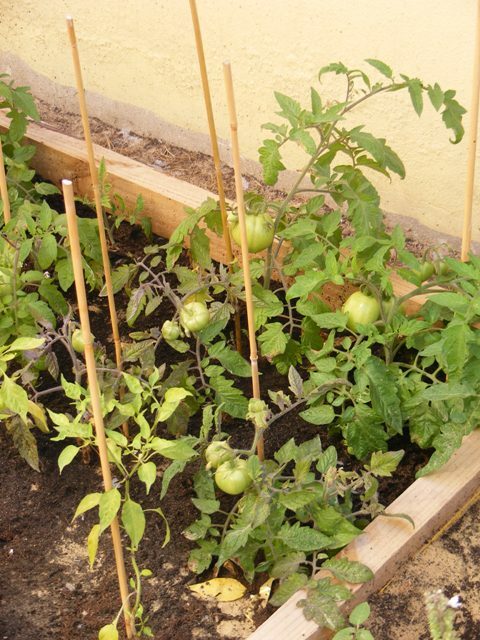 Tomatoes ~ You have to provide a trellis or a system which can support the tomato plants becoz they tend to become very heavy once they start bearing fruits. 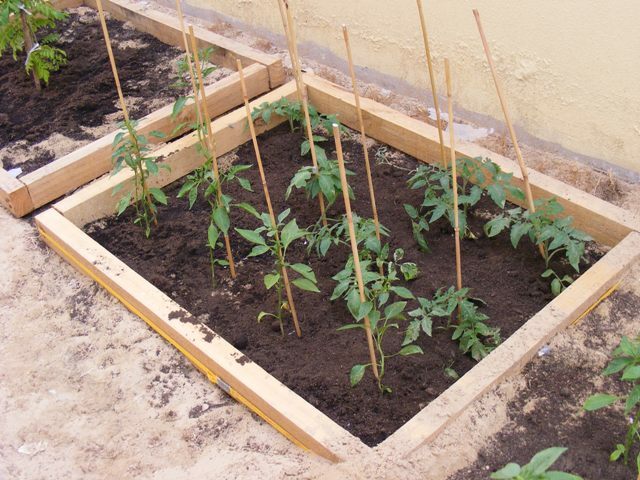 Raised bed with Pallets for cabbage and aubergine. Quite honestly, it has been just booming since then !! 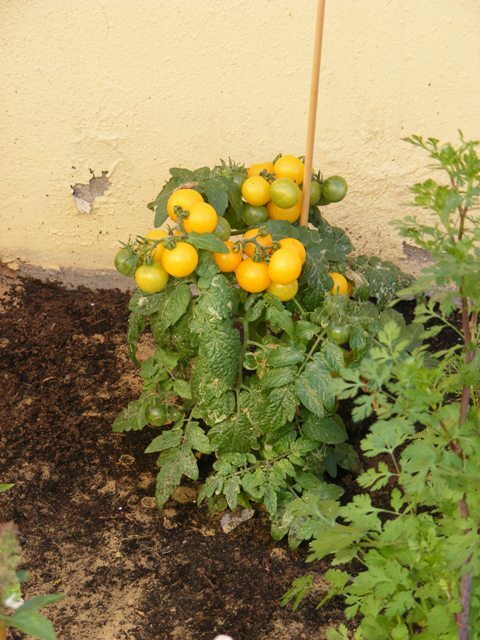 Very little maintenance and we’ve had an endless supply of tomatoes, green chillies, curry leaves and coriander leaves. 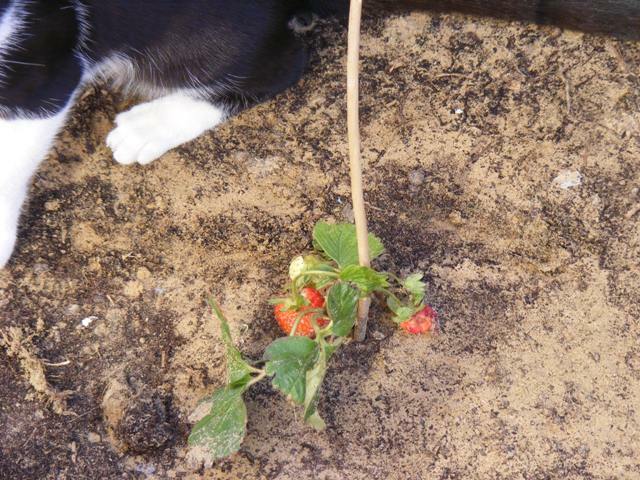 All the trees have rewarded us with their first fruits. Yippee !! 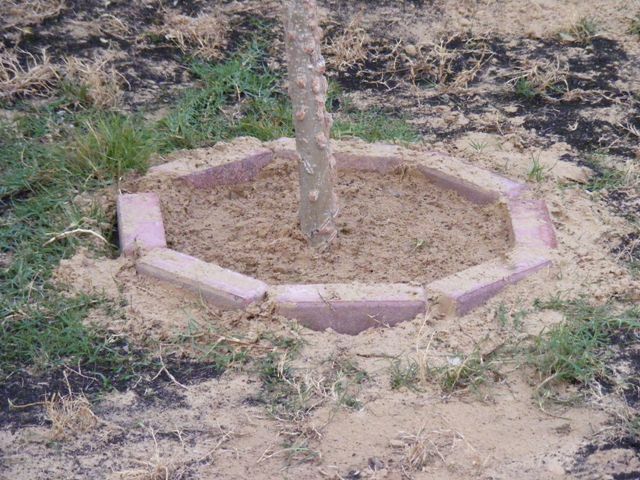 All the photographs below are of almost 3 – 4 weeks after being planted. Can you spot the lemon ?? 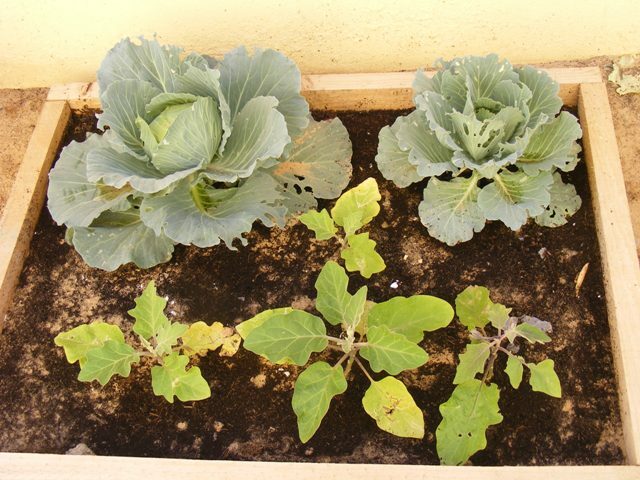 At this point, the cabbage started having uninvited visitors ~ green caterpillars. These cherry tomatoes were so sweet once they turned red. 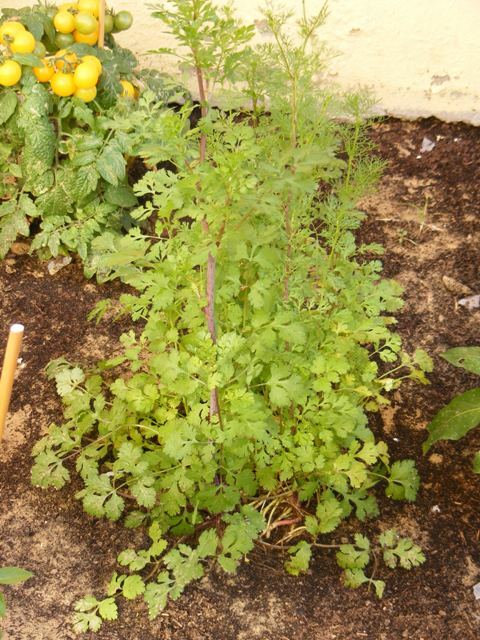 The coriander just took off ~ it grew into a bush !! 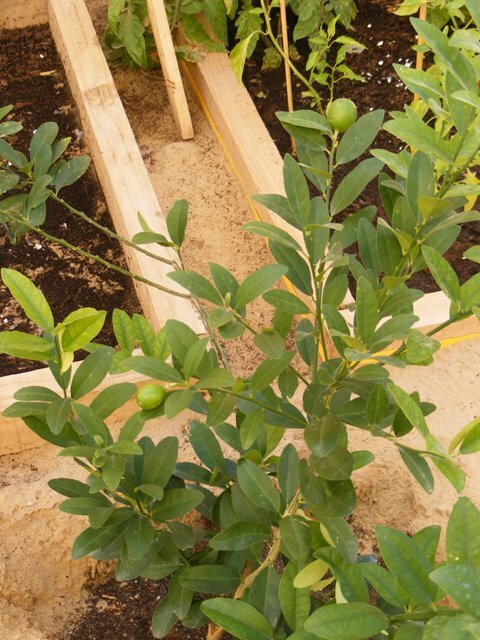 Can you spot the fruit ? 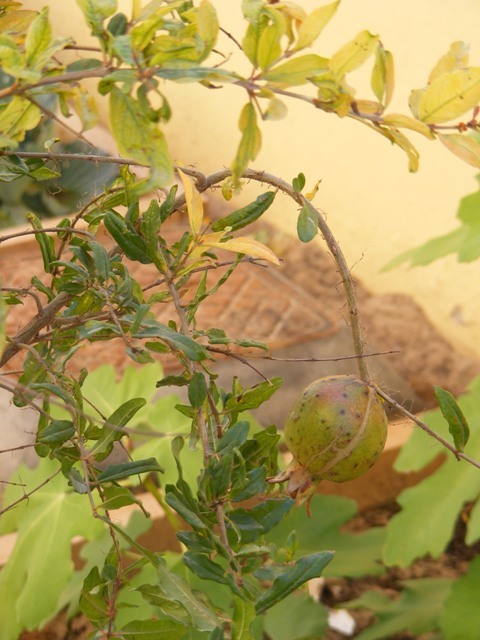 What fruit is it ? 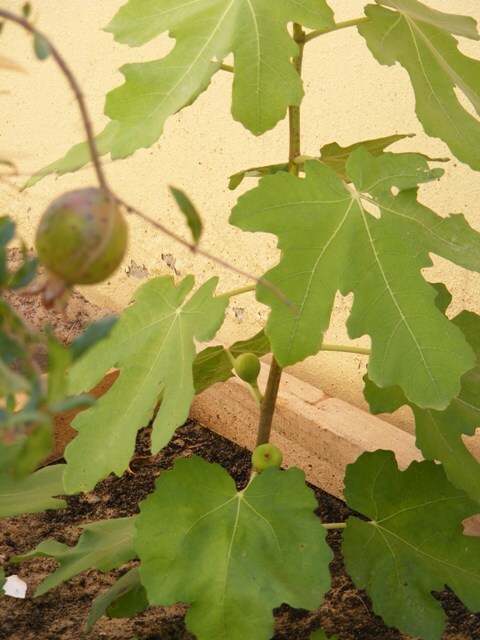 I love the shape of the leaves of this fig plant. And that’s where the fairy tale ends !! Ofcourse, this will not last long. Come May, the heat will dry everything out 😦 We have tied a nice canopy from Ace Hardware above the tree area so that they manage to survive the summer. In the summer, even a tiny protection from the sun goes a long way . So from November, right uptil now, April ~ we have been happily blessed with the fruit of our small hardwork. Not only are the tomatoes more juicy but they are so much more sweeter than the store bought ones. 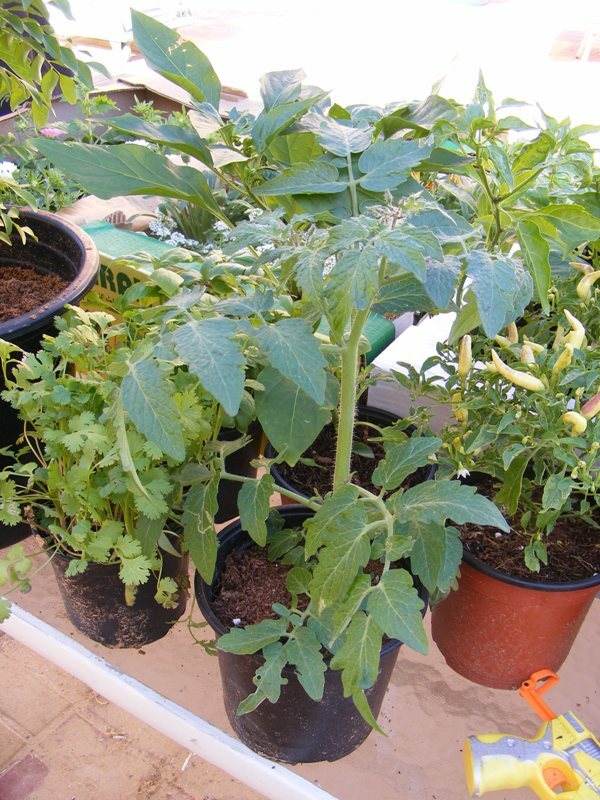 If you’re living in Dubai and even if you have only a small balcony to spare, I highly recommend that you plant a few tomatoes, green chillies and coriander in pots. 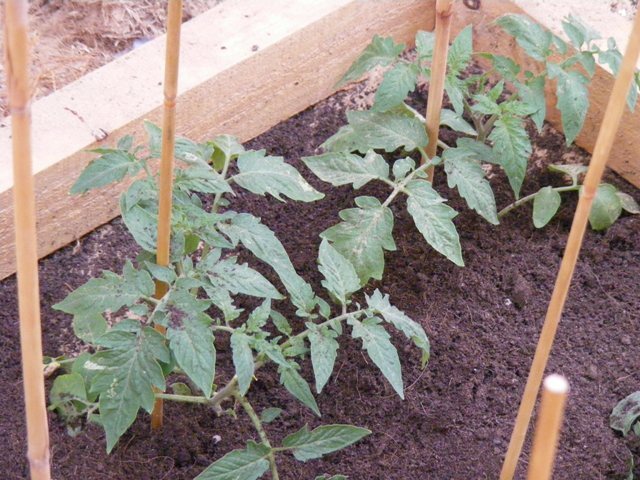 Just remember to give some form of elevation to support the tomato plants. 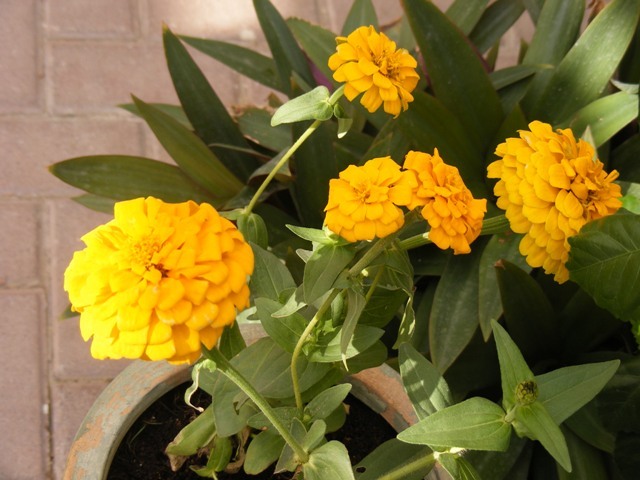 You’ll be surprised and delighted at how quickly the plants grow. 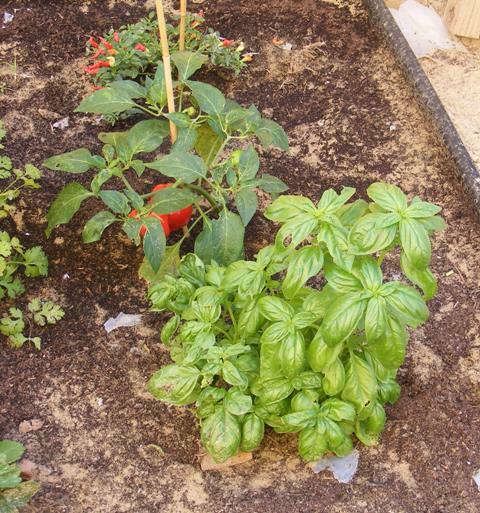 I am sharing my little kitchen garden a.k.a Herb garden with all my friends at their fantastic parties here. 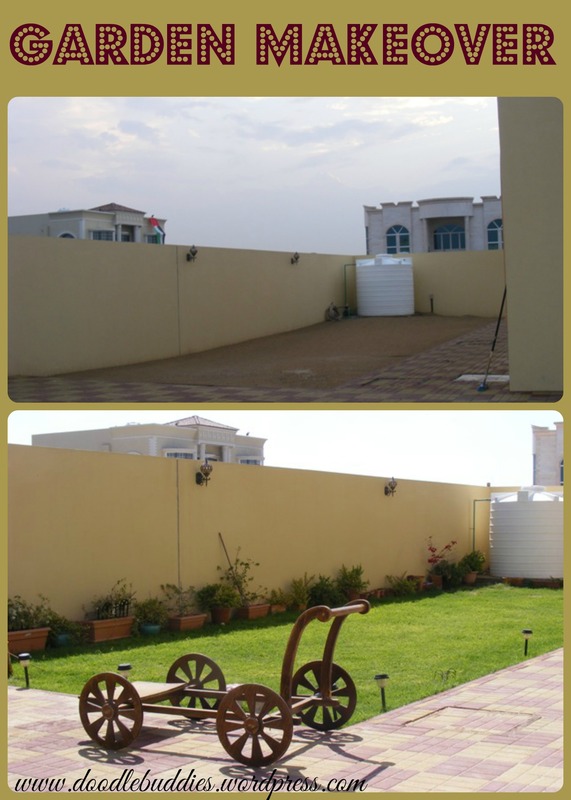 The Final Garden Makeover ! 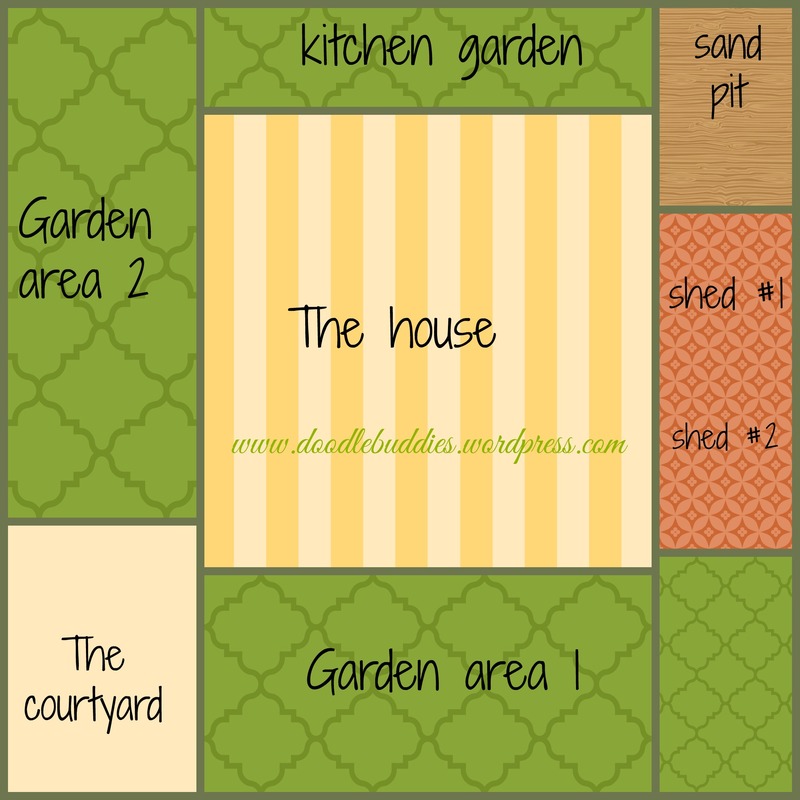 This is the house plan ~ so its easy to understand where the gardens are. 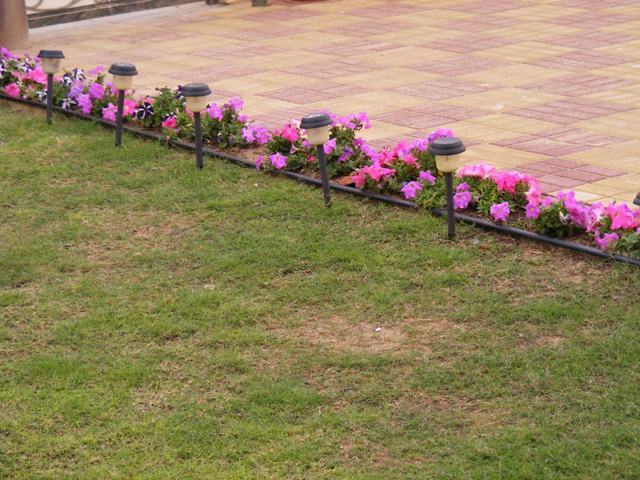 In the picture below, these solar powered lamps are available at ACE hardware. We’ve had ours for nearly 4 years and you just need to change the battery and clean the small solar panel on the head of the lamp and your ready to go !! Inorder to keep the grass away from the Petunia, We have placed a large plastic/rubber tube ~ this goes into the ground nearly 1 foot. But it is an expensive buy. 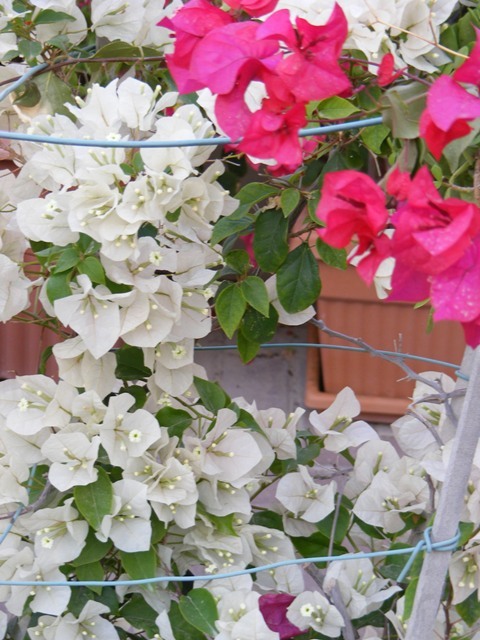 These bougainvillea have also seen many years with us and although they have thrown this beautiful pink pops all over the garden, for some reason they have not given a lot of leaves this year ! hmm ~ I wonder why ?? That’s the wheel cart, that Daddy repaired below. The whole idea was to place the smaller round pots into the open space of the cart. But I rejected that decision and let it just add an ethnic look, instead. 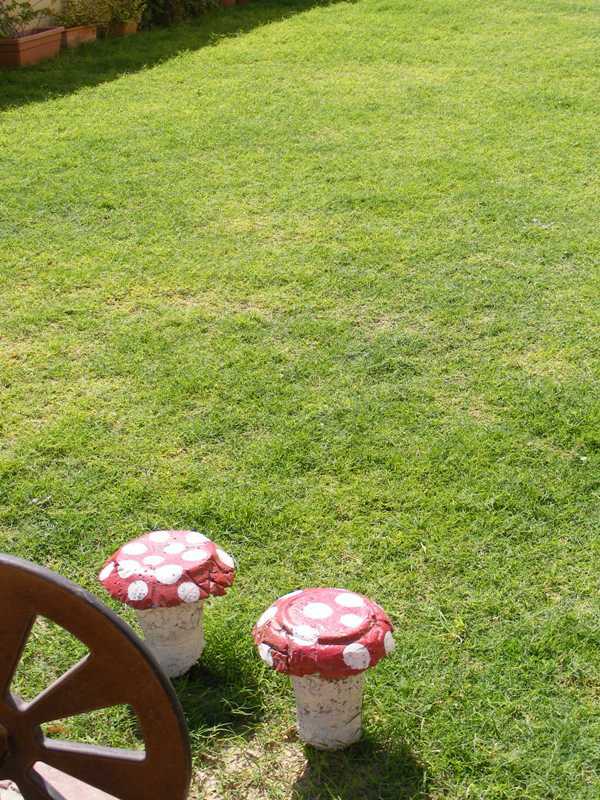 Remember the concrete Mushrooms ? To view the tutorial of how I made them, please visit here. 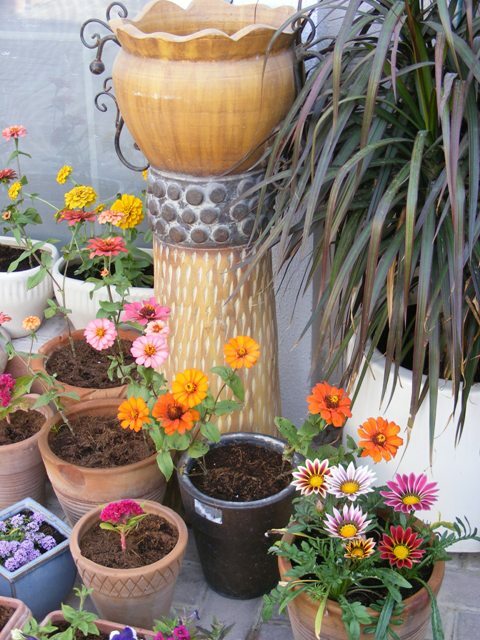 All these pots mainly carry seasonal flowers except some of them are beds for Zenia and Desert Rose. 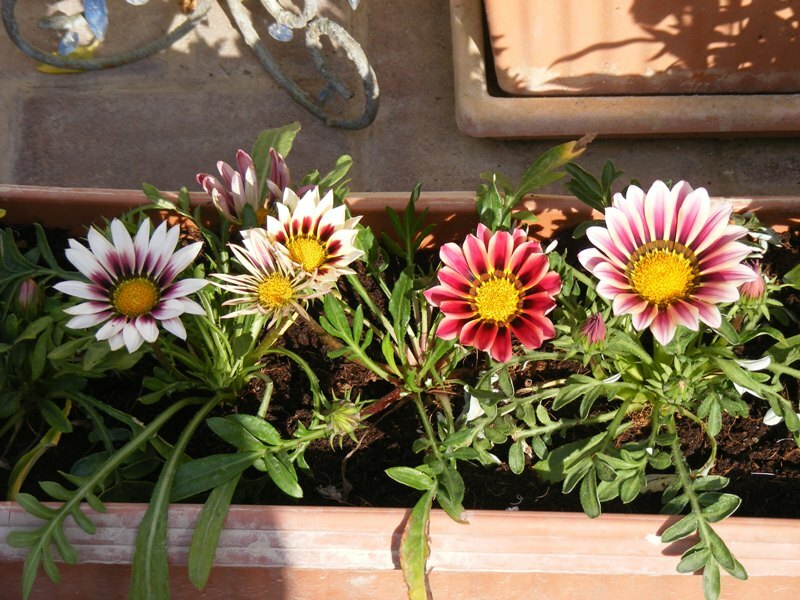 Here are some of the seasonal plants that we planted in the pots this December. 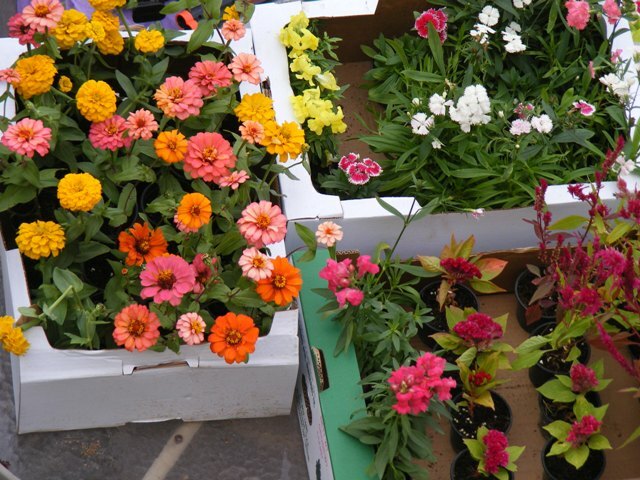 We bought scores and scores of these bright and happy seasonal flowers from Al Warsan. 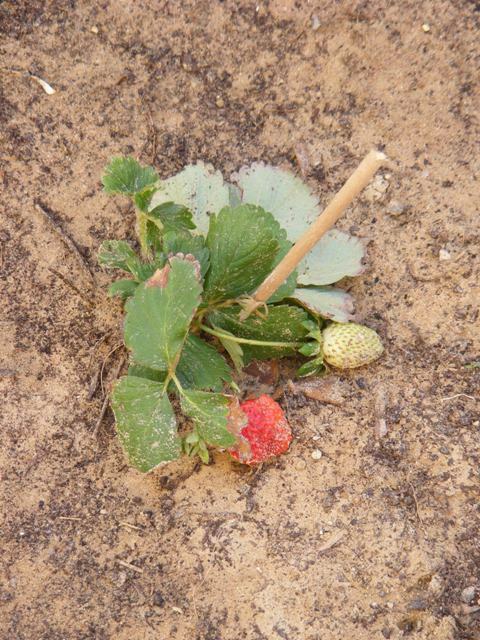 Most of them cost dhs 15 – 12 per dozen. Some however are more expensive. 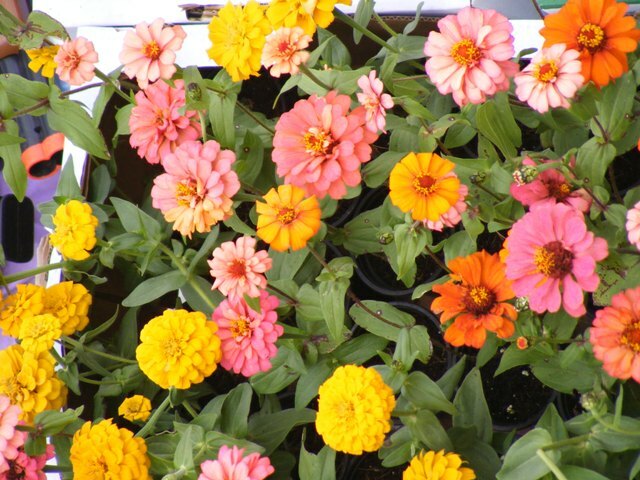 Most of the seasonals can be planted by late November and will bloom till around late April/Early May. 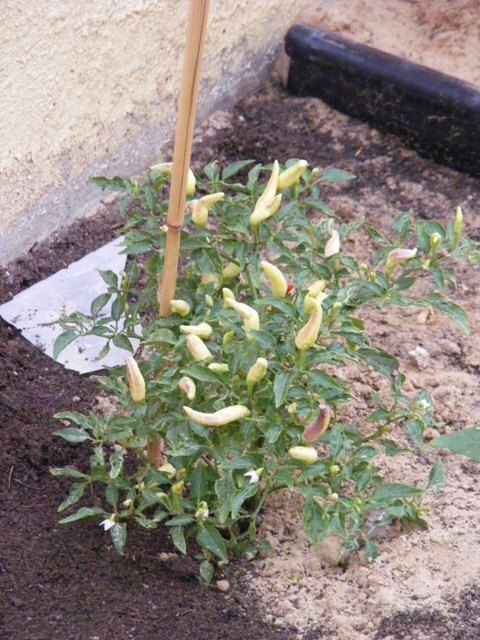 White bougunvilae always look so pretty, Isnt it ? 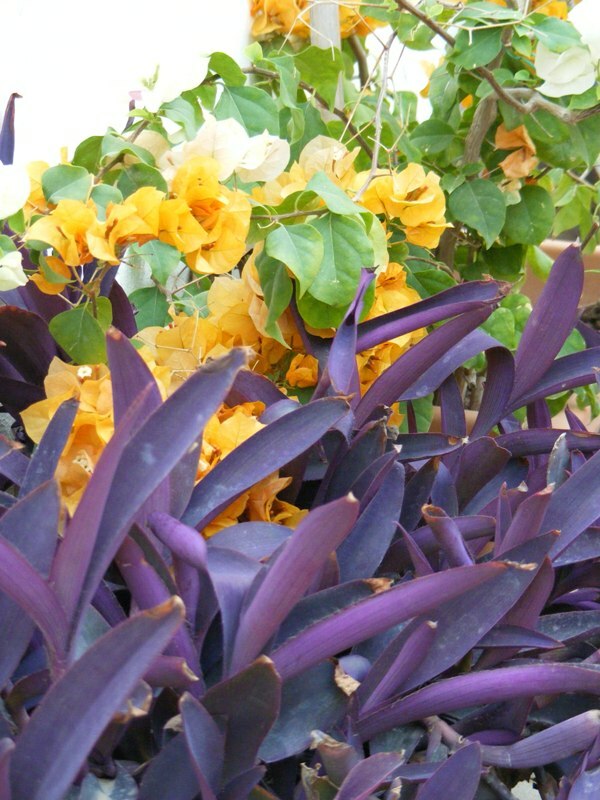 This purple shrubby plant is mainly leaves but they do give out lavender colored flowers between January to Feb.
One of the best quality of the bouganvilea is that you can actually mold it into your desired shape ~ like a topiary. 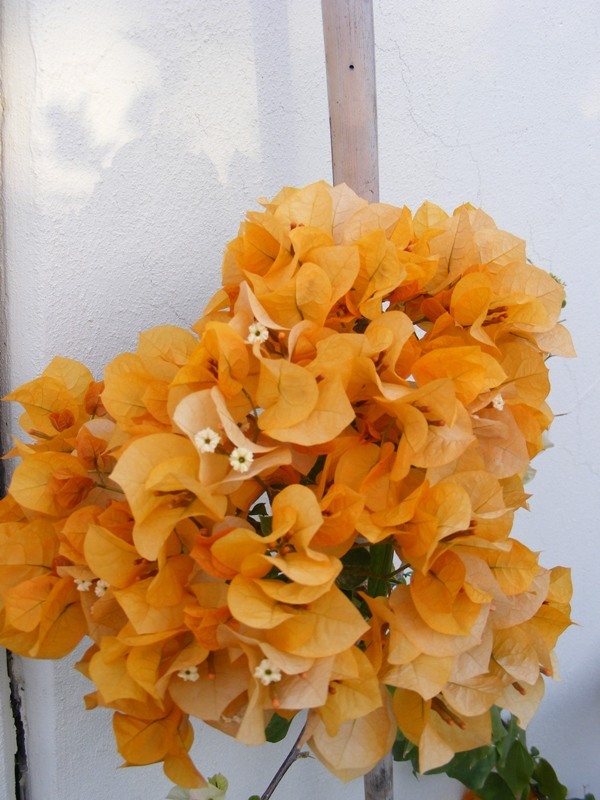 Doesn’t this yellow one look like a bouquet ? 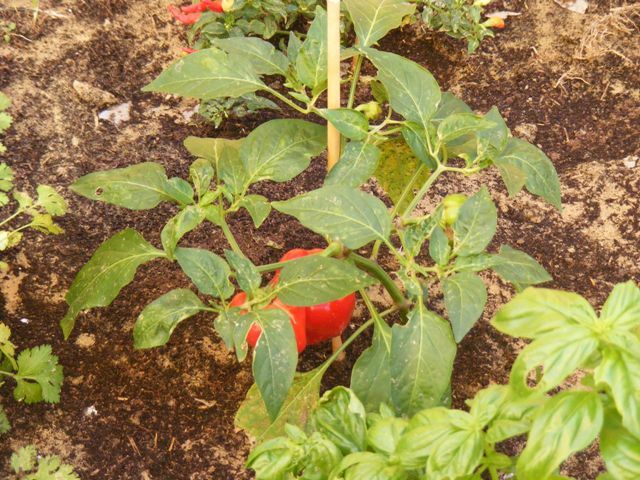 I hope you are inspired to try out alittle gardening this year. 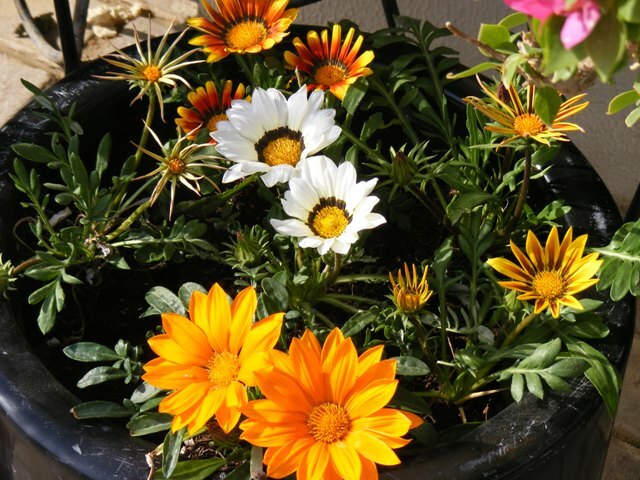 If you find so many flowers and plants overwhelming, just try out with 3 or 4 planters and some shrubs, Aloe vera or Desert rose and see how that grows ~ shrubs are resiliant and can adapt with very little water so you really cant go very wrong with them. 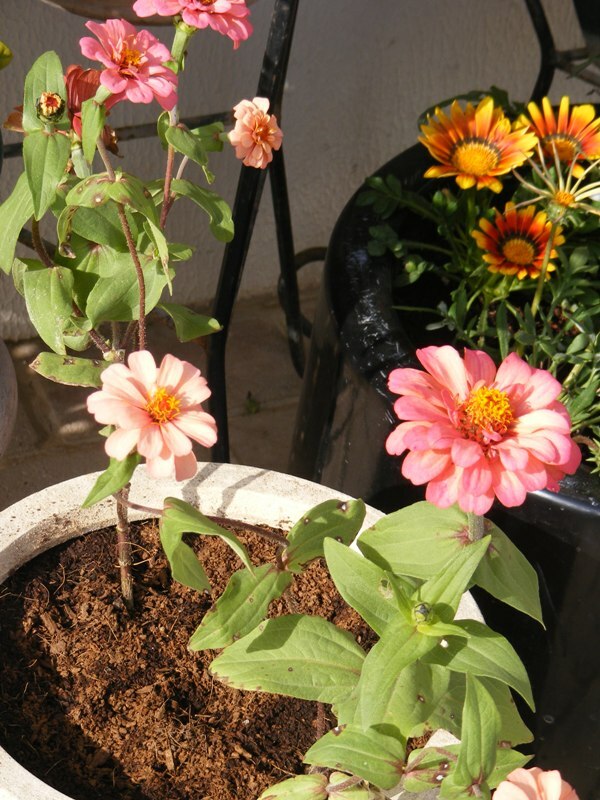 When I was growing up, both my mom and my grandma had green thumbs so as much as I didn’t really bother about gardening or looking after plants, I guess, it came naturally once I got married 🙂 I am not a professional at gardening by any means, I used to read a lot of books when I had started balcony gardening, initially around 10 years back ~ kept learning by trial and error and I am thankful for all those mistakes coz it made me a wiser gardening person, today. I am sharing this post with my dear friends at the following parties here . 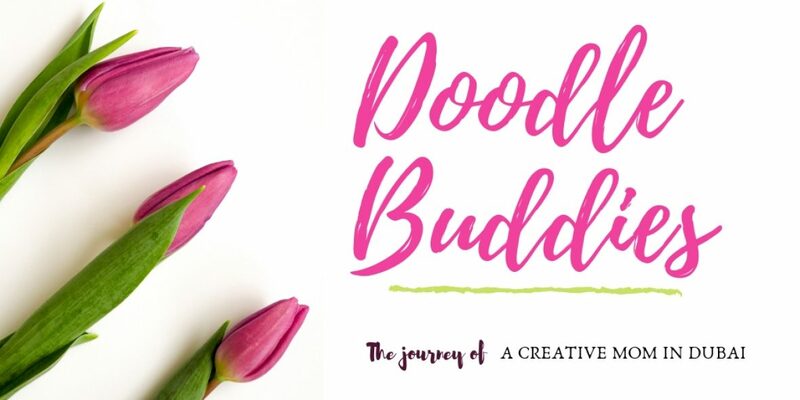 Thank you for visiting me today and if you liked what you saw, please subscribe to my blog posts by any of the following media. 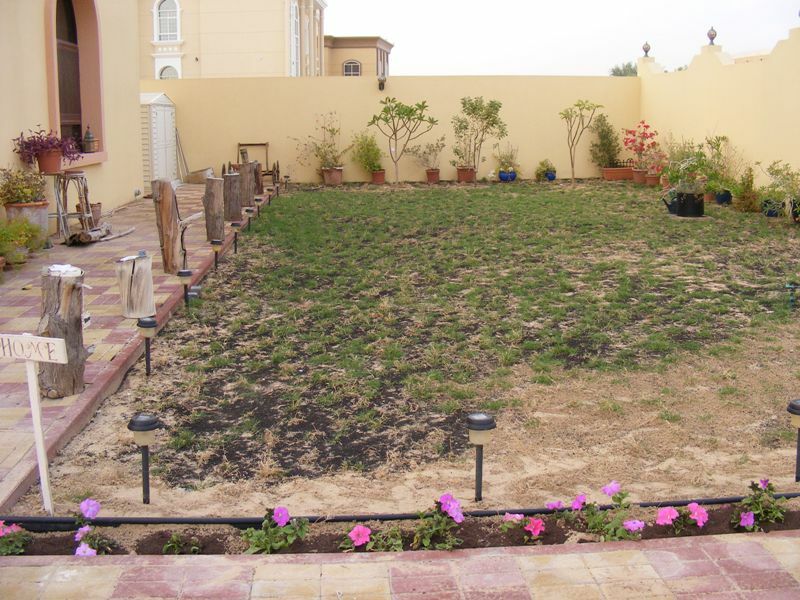 Gardening in Dubai ~ Growing grass in the desert !! 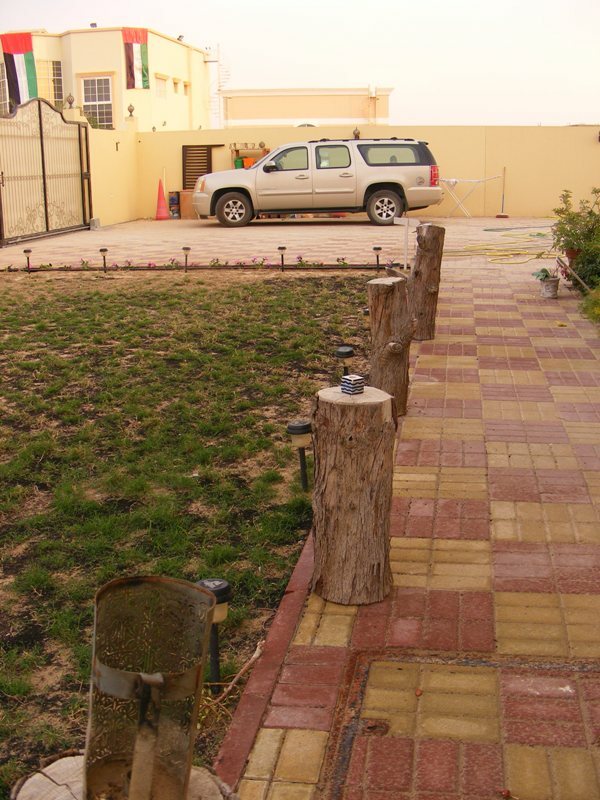 This is the third post on our Garden Makeover. 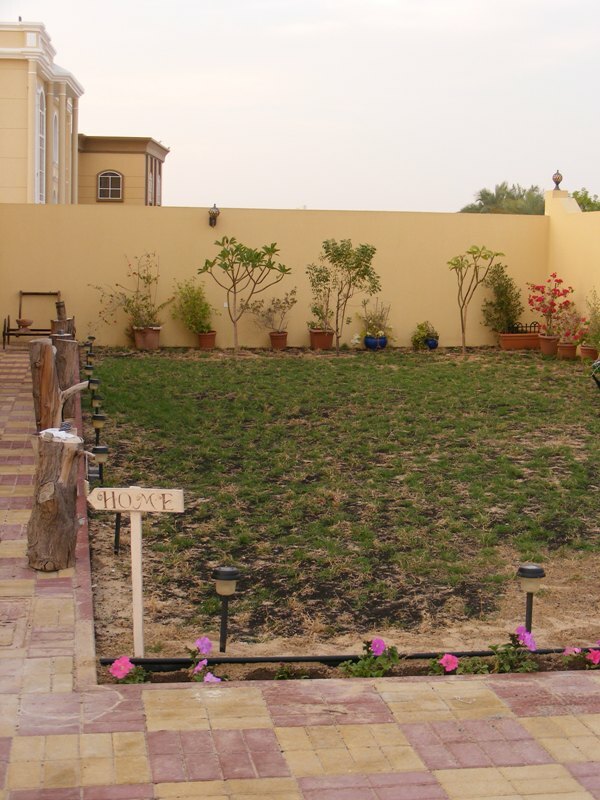 In Dubai (and for that matter, most of the Arabian peninsula), grass is a luxury. 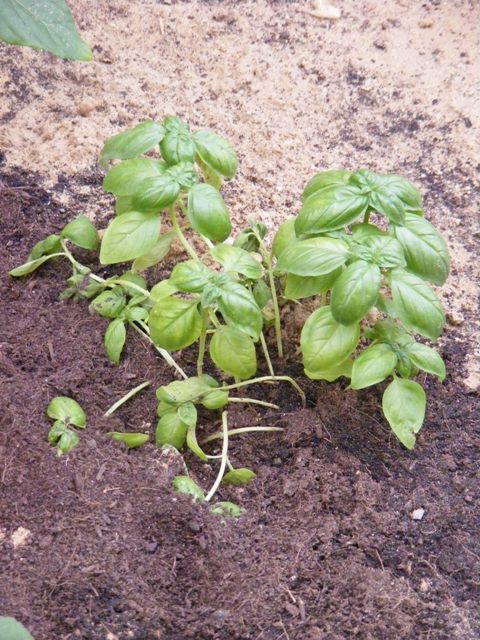 Infact, growing plants is not as easy as in some other parts of the world. 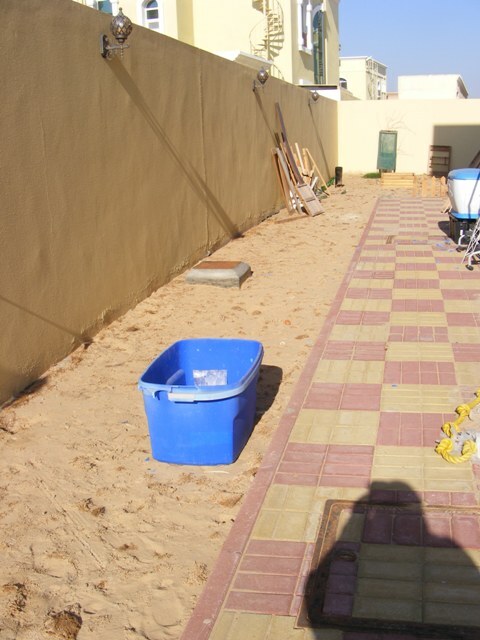 The weather is harsh for a good 6-7 months ~ The area is covered with predominantly with shifting sands. 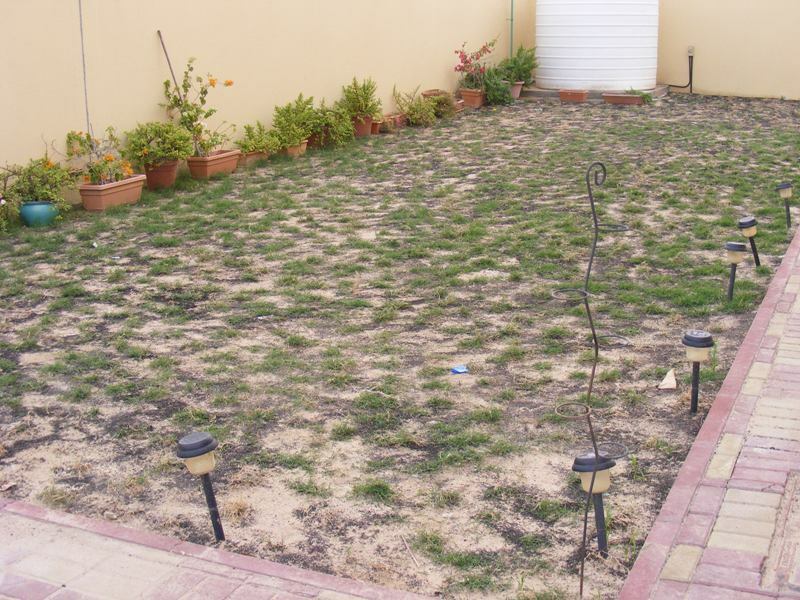 Hence the soil is not really suitable for grass and a lot of effort has to be made to make it possible for the grass to find nutrition from the soil, strength, support and some shelter from the summer heat. 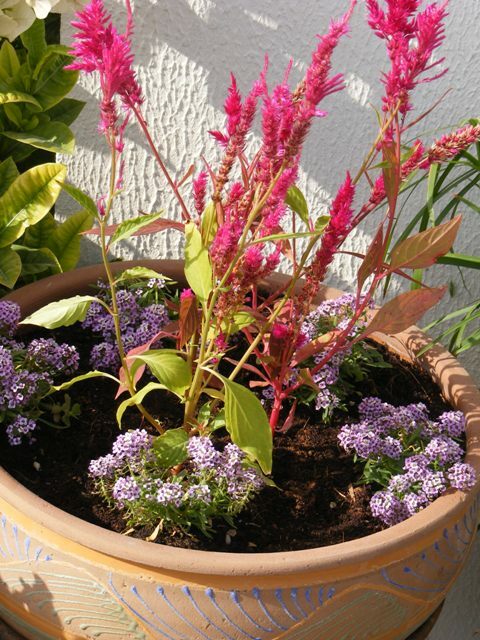 Having a balcony garden comes with its own advantages. 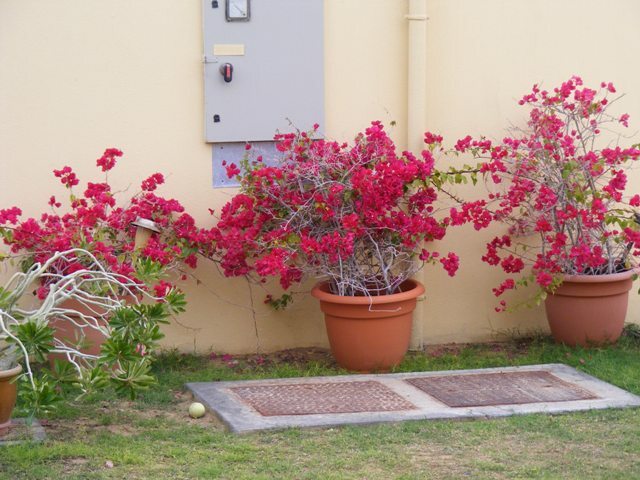 A large variety of plants manage to grow in shelter. 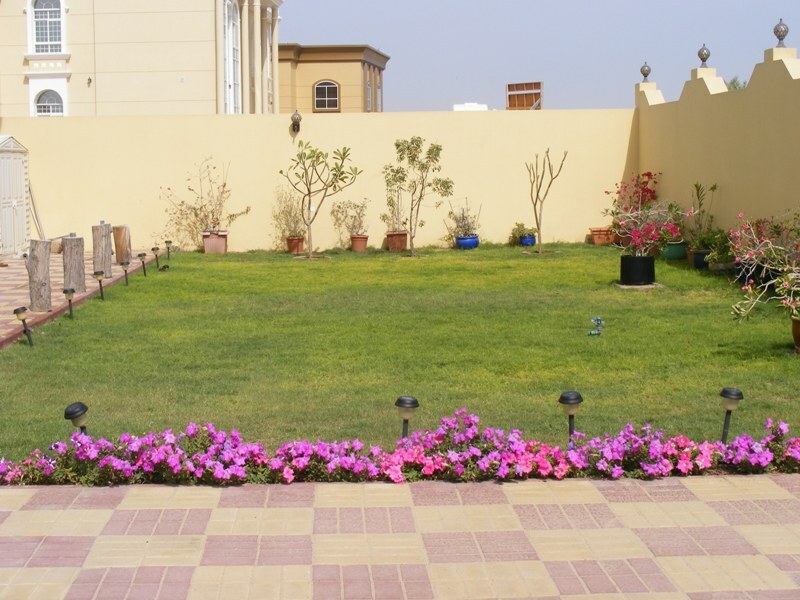 Money-plants creeping on a trellis, potted plants which can be protected from the scorching sun ~ and a single corner or edge to water, makes balcony gardens ideal. 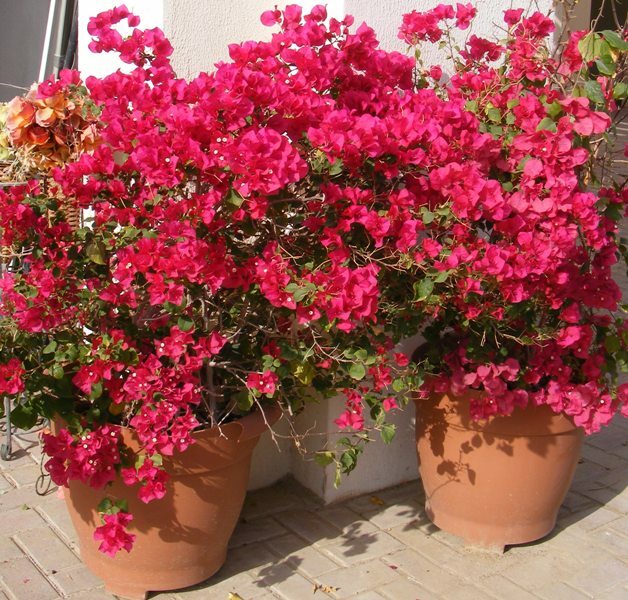 If your a newbie trying to activate your green thumb, I suggest a quick visit to Dubai Garden Center would be a good idea, for some sound advice and a large variety of plant collection ~ however you could also visit Al Warsaan Nurseries area ( located on the Dubai-Hatta road ) for more competitive rates. 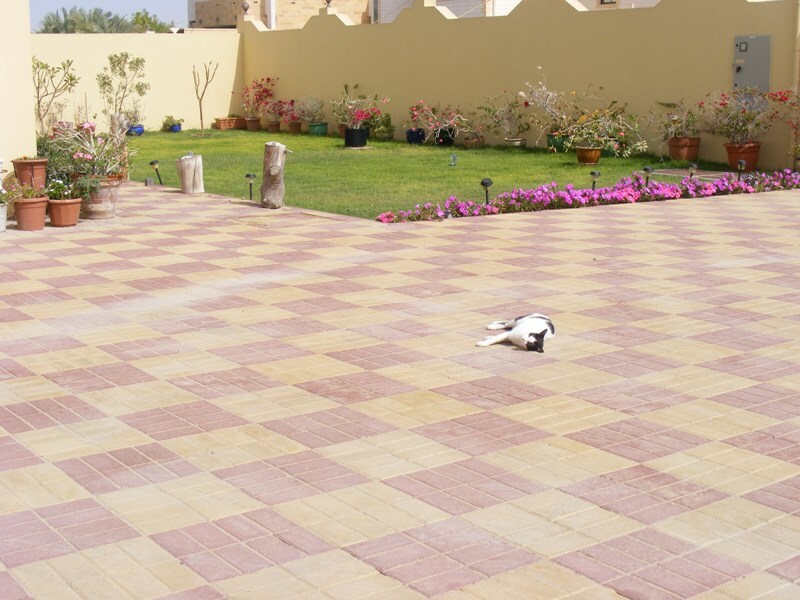 1) The carpet system. Where rolls and rolls of grass are got and planted on a mixture of compost and soil. It is rather expensive but the results are more quick and it sustains well. 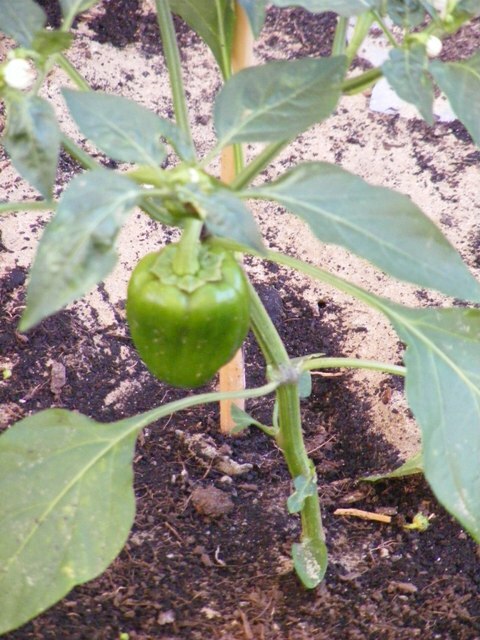 2) Plug in : The second way is where, small patches of grass are plugged into a large and thick layer of compost. 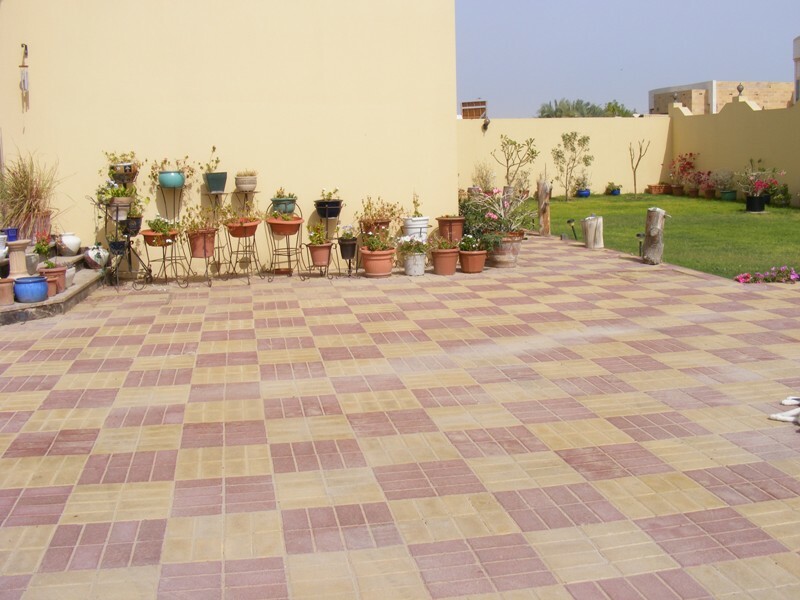 Over a period of 50 – 60 days the small patches of grass spread across and fill the area like a carpet. There are various types/qualities of grasses too like the American and sharji grass ~ but don’t get too overwhelmed by these names, sharji grass is equally good ~ it all boils down to how well you look after the grass. 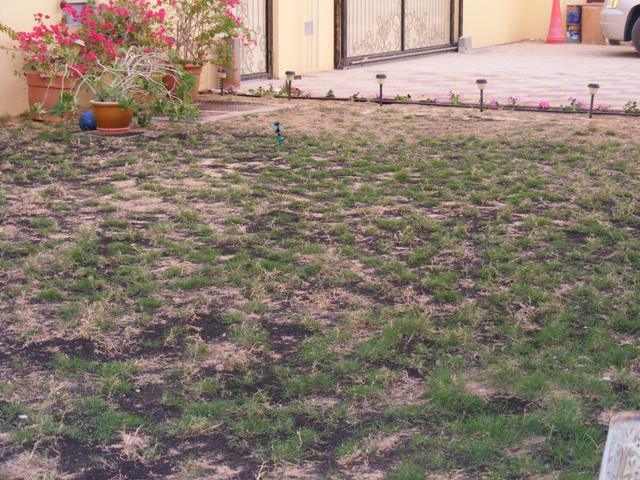 The upkeep of grass is rather expensive and high maintenance. 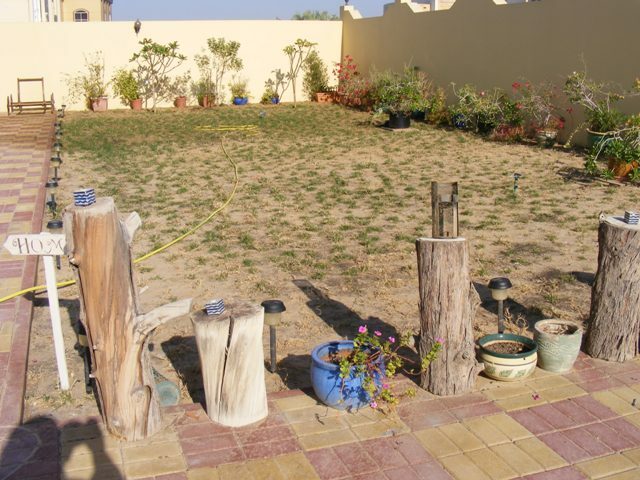 Apart from the regular mowing and weed collection ~ in Dubai, we have to water the grass twice a day in the summers !! Like I said ~ it is high maintenance. 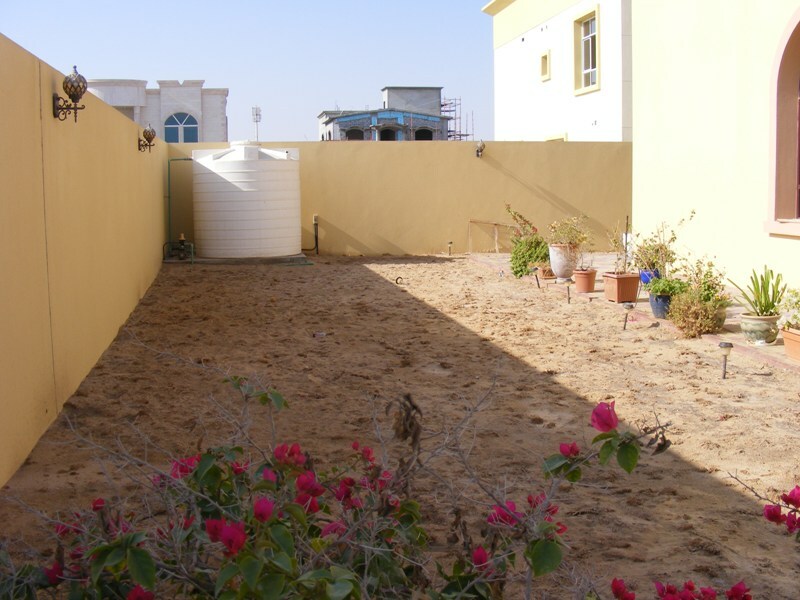 The Electric & Water rates in Dubai are monstrously high so we decided to have a tube well dug. Sadly, even at 45 feet below ~ we could not find any sweet water but salty water was in abundance. That was literally money-gone-down-the-well !! 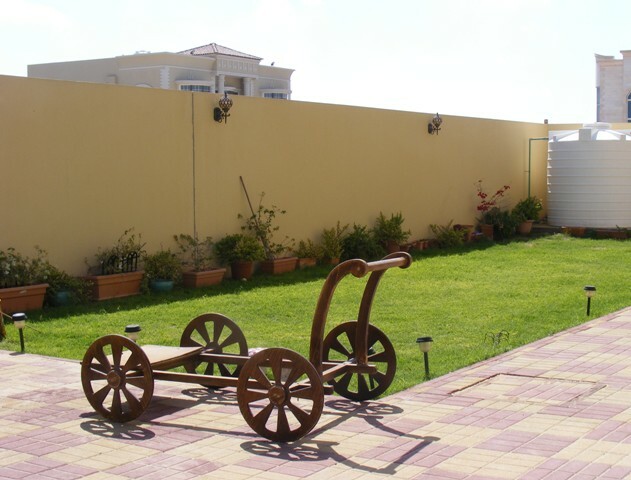 For as long as I can remember, We’ve loved having a lawn in our home but since we stayed right infront of the community garden at the Ranches, we opted for paving our backyard so that the boys could be “boys” and have fun cycling etc in the courtyard. 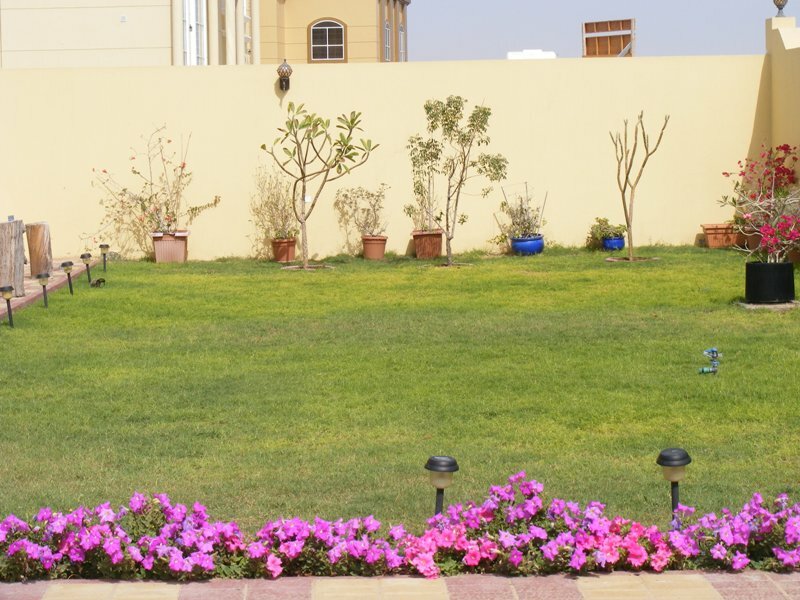 If your garden space is small, you might want to consider looking after it yourself, however, if your garden is very large, hiring a gardener may be a good idea. “Labor” rates in Dubai are relatively low in comparison to some of the other western countries. But you rarely get skilled and knowledgeable gardeners here. Most gardeners belong to small scale gardening firms who source “common labor” from Asia ~ with barely ANY knowledge in gardening. Most of them are taught to water and that’s that !! 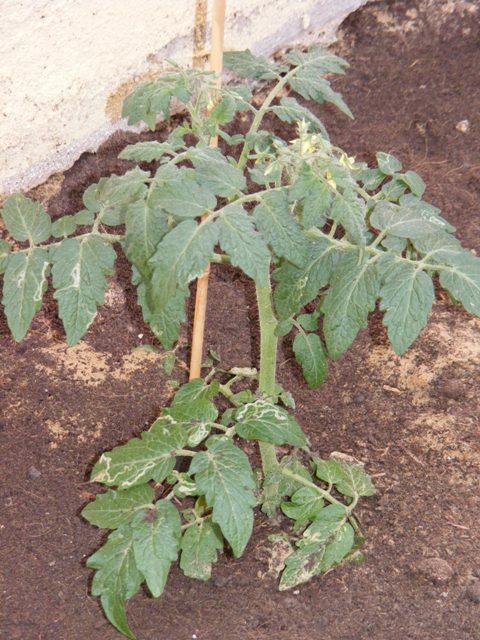 While you notice the first signs of a plant withering ~ ask your gardener to keep a careful eye on it ( keep it in the intensive care area )~ Different plants have different reasons for withering, excess of water, potassium level in the soil, need for fertilizer, direct sunlight etc. are just some reasons. If you don’t ask, you’ll never know ! So know when he is going to use MPK as well. 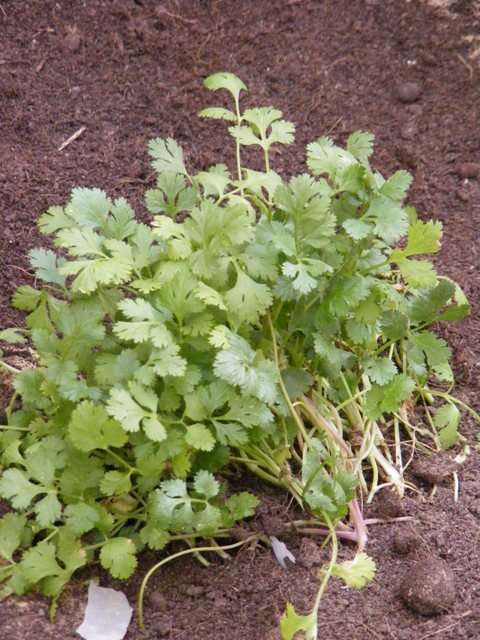 Most gardeners are not aware of the difference between weed – grass – plants. Be patient and show them the difference. 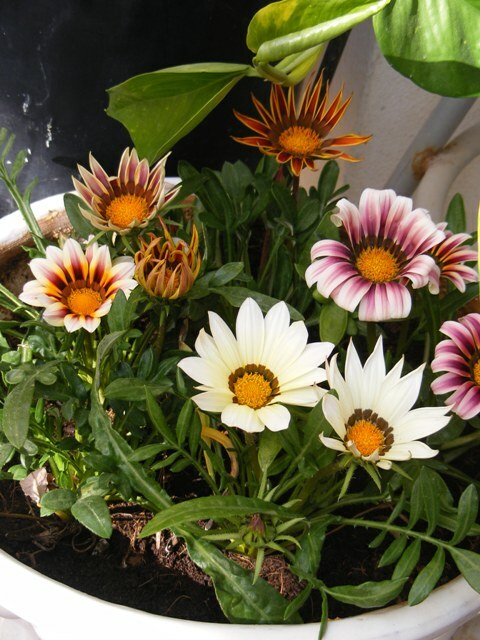 Most gardeners are not aware of the different bugs that effect plants. 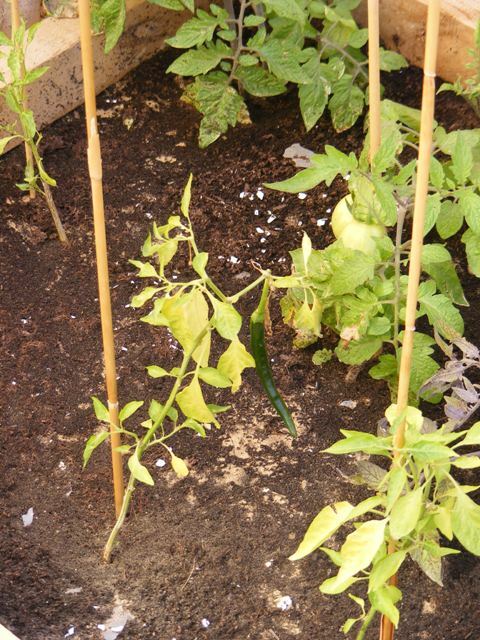 eg mealy bugs or caterpillar and how to treat them. Ask the supervisor to visit once a month ~ without fail !! 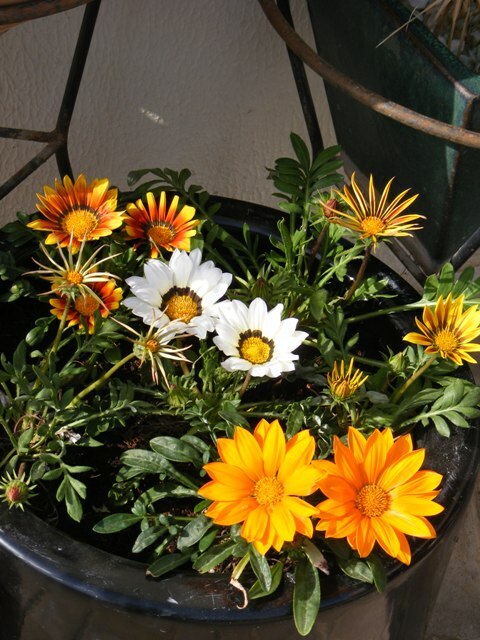 One of my early observations about gardeners was that, in most cases, they are not aware of which plants need partial sunlight and less amount of water !! 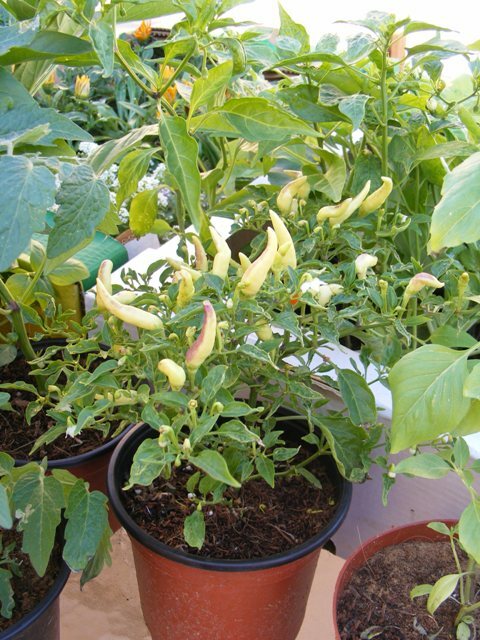 So if your going to bring new plants ~ its best to do some research on your own, rather than relying on the gardener. 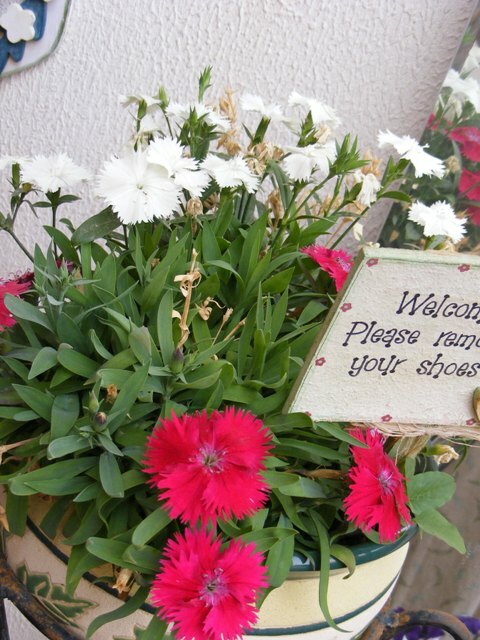 It is human nature to always take the easy route ~ gardeners are no exception to the rule. Given the chance they will be happy to throw in some water in a jiffy and rush out of the villa. 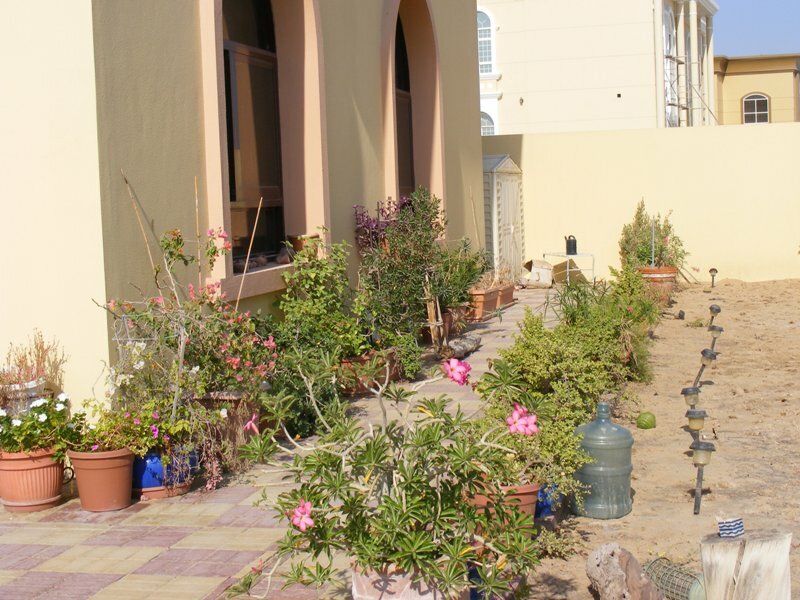 So in short, as much as having a gardening help is a blessing in Dubai ~ you have to be active, keep an eye on your plants and regularly check their progress. 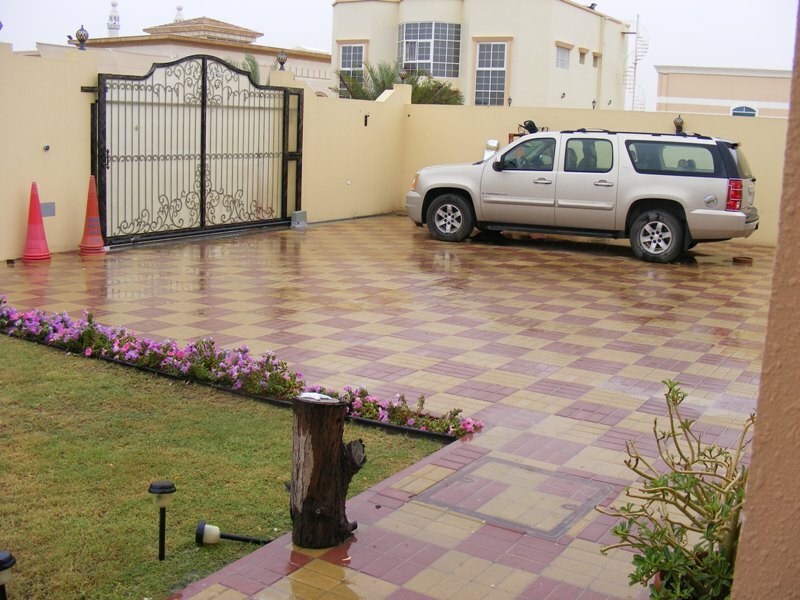 One of the benefits of having a lawn in your home is that it holds back the sand from entering the house. 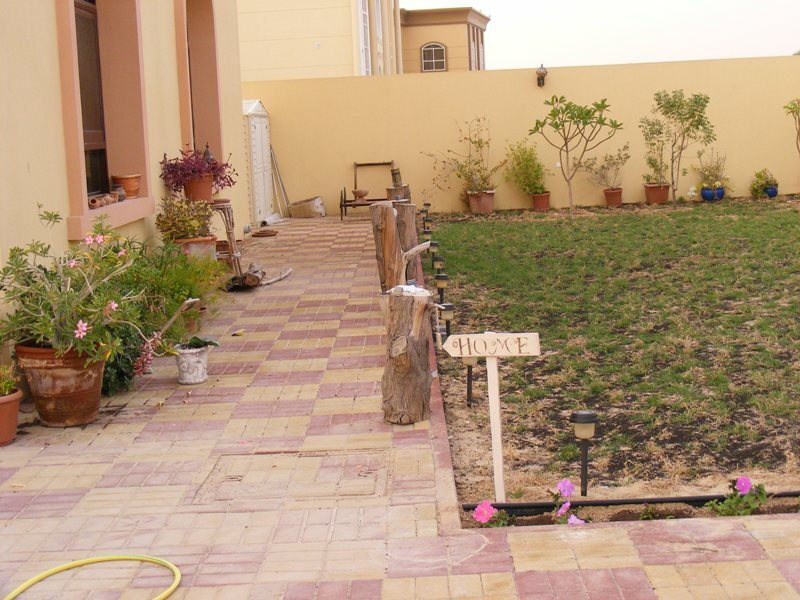 Since we had already made-up our minds on having the grass placed in two areas of the house (the picture will help you understand better ) ~ we opted for the second way of planting the grass ~ we negotiated a good deal with our gardener who then got a couple of fellows and had the job done. 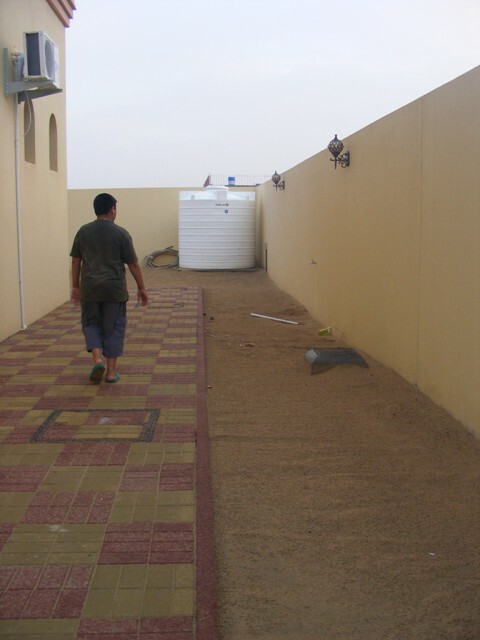 Naturally, we were going to have to feed the grass municipality water ($$$) and that really had me worried initially. 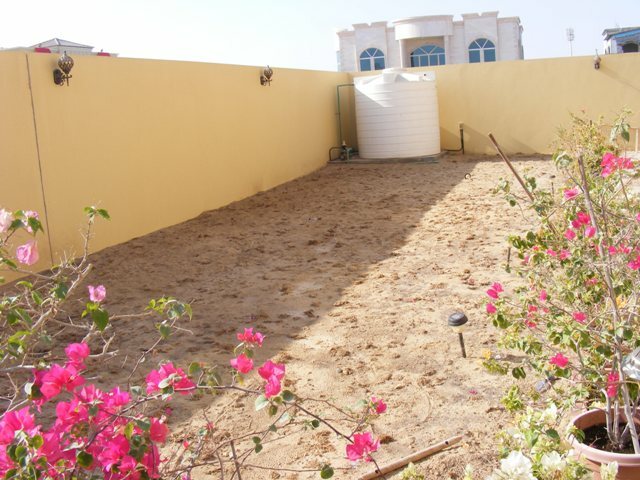 Al Warqa house is surrounded by a huge plot of sandy land and some pavement on all sides. We decided to lay out the grass on two of the largest “front” areas. 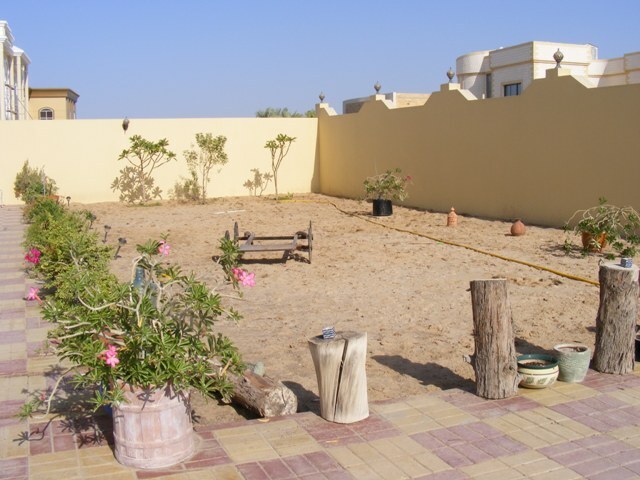 There is one sand pit for the cats to enjoy, at the back of the house. Two large 6 ft x 6 ft sheds sit on the back side as well. These, we’ve carried from our previous home. 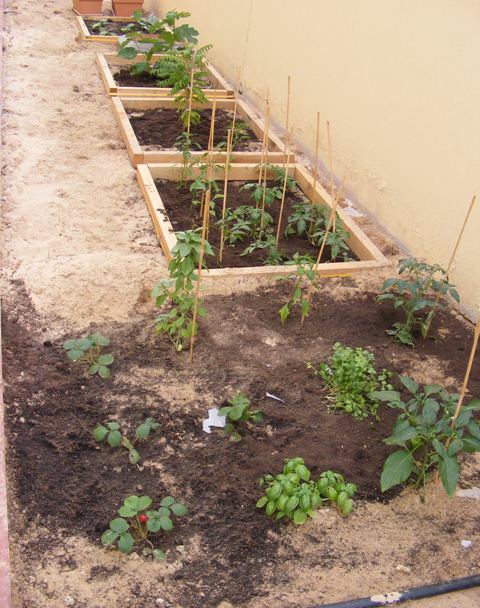 This is what I had in mind when we started the garden project. And I’m happy to report that progress has been slow but fulfilling. 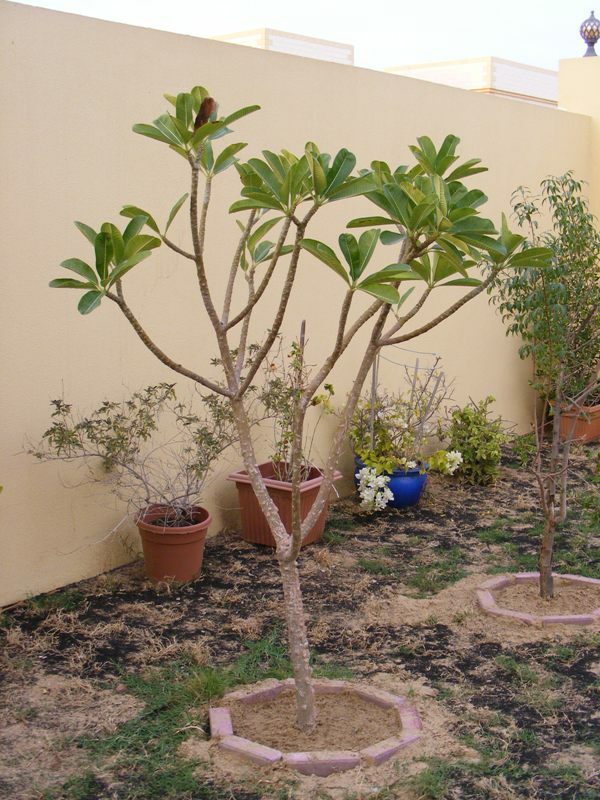 Some trees that thrive really well in Dubai are Palm trees, Damask trees, Neem trees, Frangi pani, and some other wild trees. 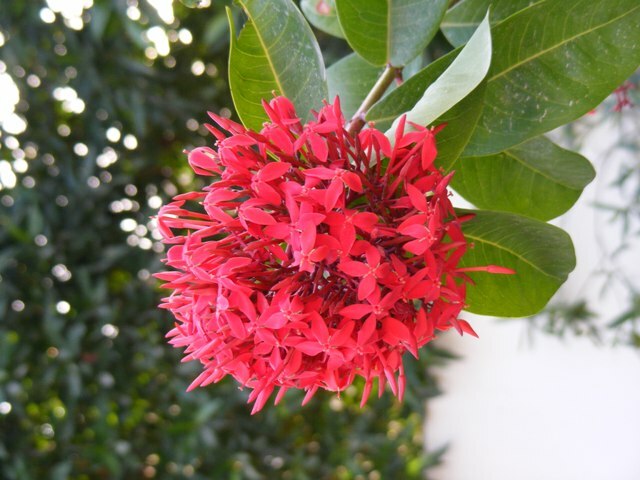 Some of the plants that survive the typical temperate climate are Bouganvillea, Desert rose, Zenia, zaater, lemon grass, fig, lemon, Aloe vera, cactus and a few more. 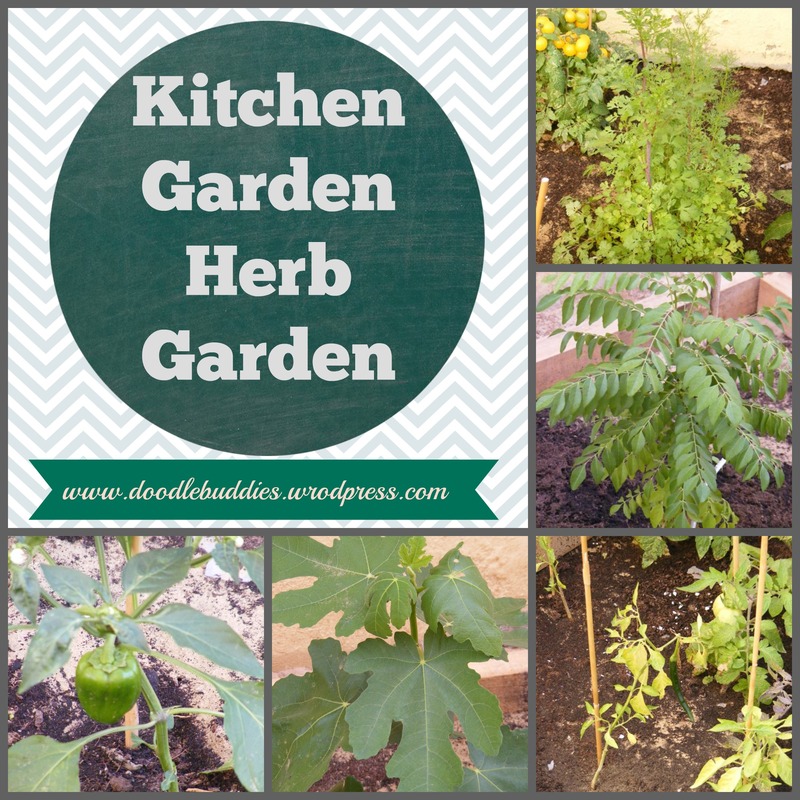 My kitchen garden hosted batches of green chillies, tomatoes, cherry tomatoes, brinjal, strawberries, cabbage, curry leaves, tulsi, basel, coriander, fig, onion and lemon. 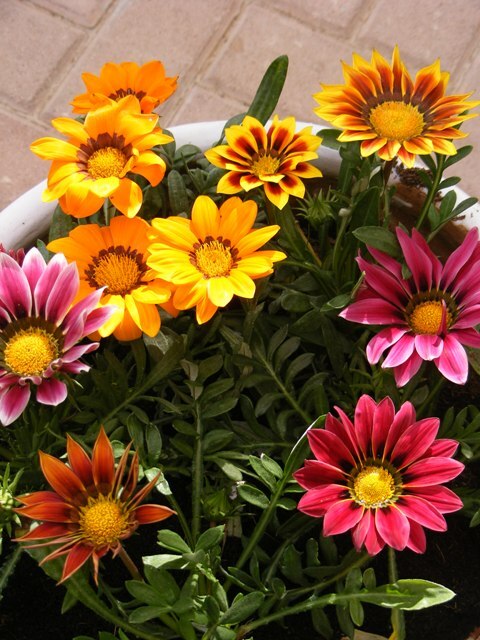 Between November to March, all seasonal flowers bring a spring-like feel to Dubai. 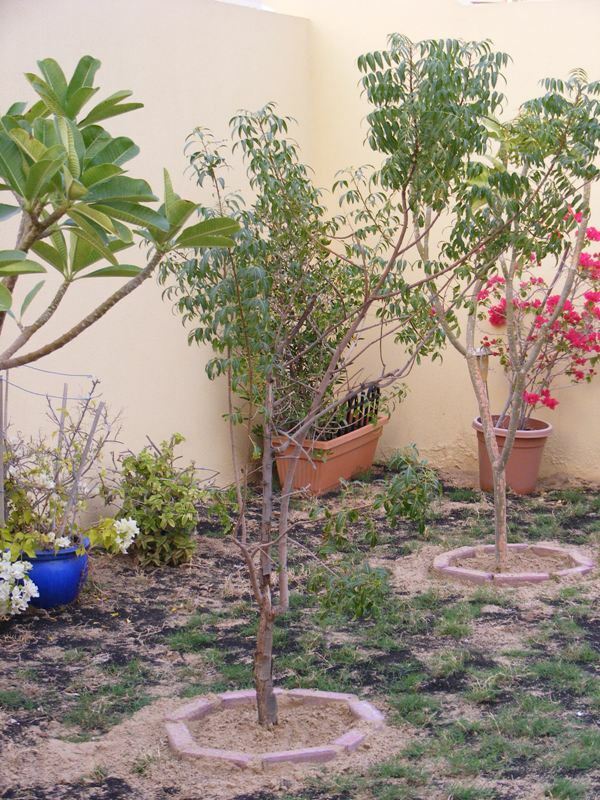 Emaar properties had issued a circular to the residents at Arabian Ranches, about the damage caused by Damask trees. 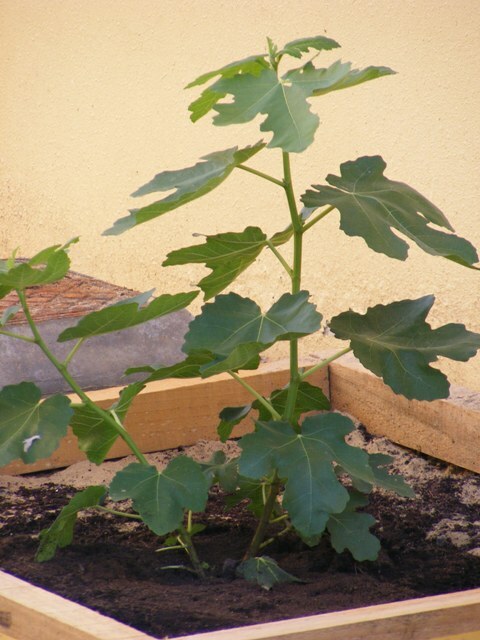 They are a very resilient breed but their roots tend to spread across large areas of land underneath the property and weekens the foundation of the house as well as the fence. 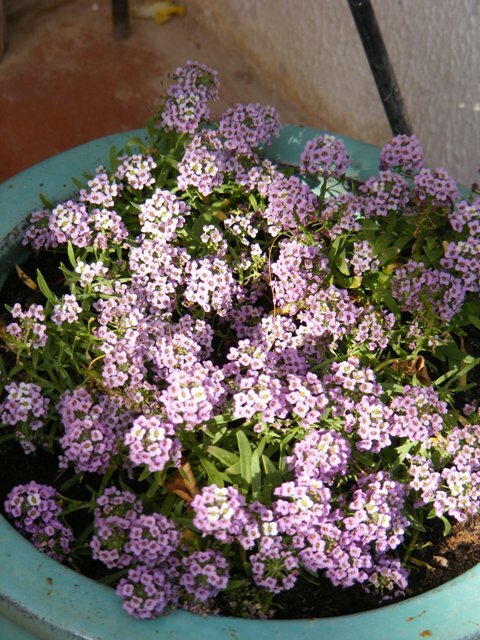 Hence we have kept ours in a large pot since many years. 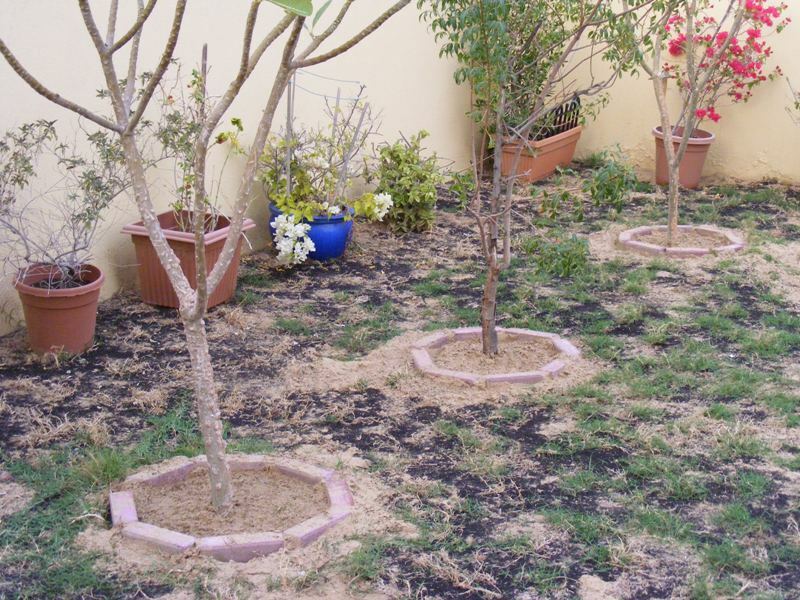 However, I decided to rehome some of my trees who had made their homes in large giant size pots, to the grass area. You can see one of the shed popping out in back side. 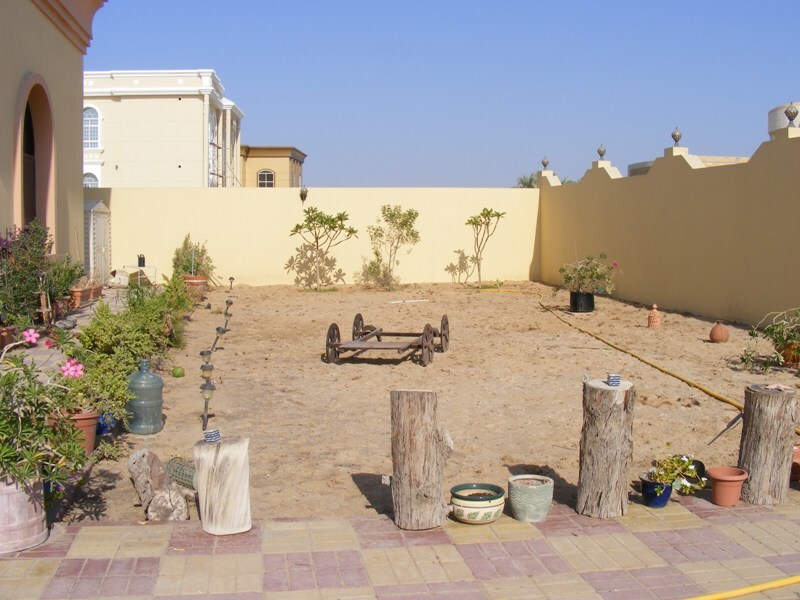 All these potted plants below have been with me for the last 8 years at the Arabian Ranches. 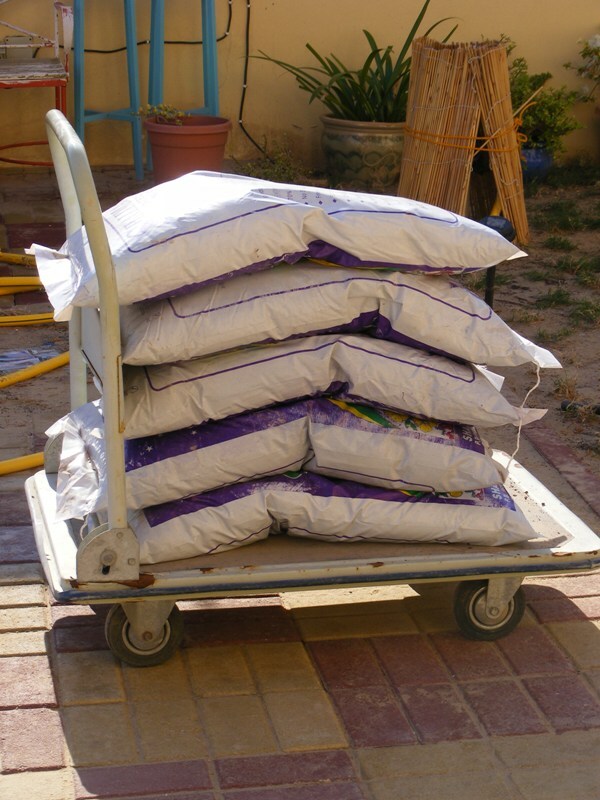 Phase 1 :- Bags of potting soil arrived. A very large part of the top soil/sand is removed/dumped and the patch is “prepared” for the compost. 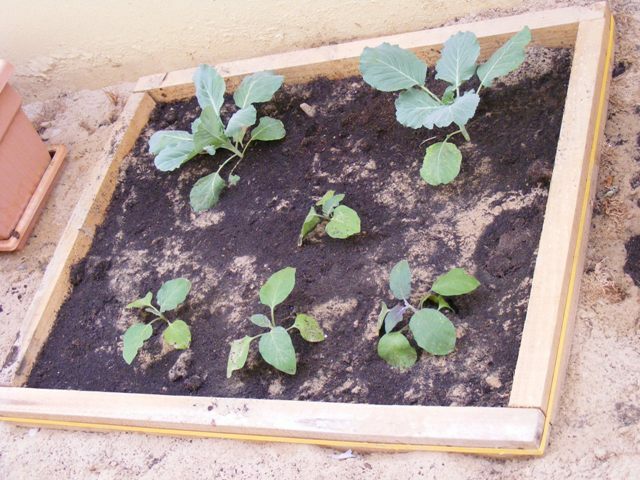 For nearly a 4 – 7 days, a bed is prepared by watering the soil. The compost is purely cow dung. Hence the stench is really unbearable for the first 2 days !! 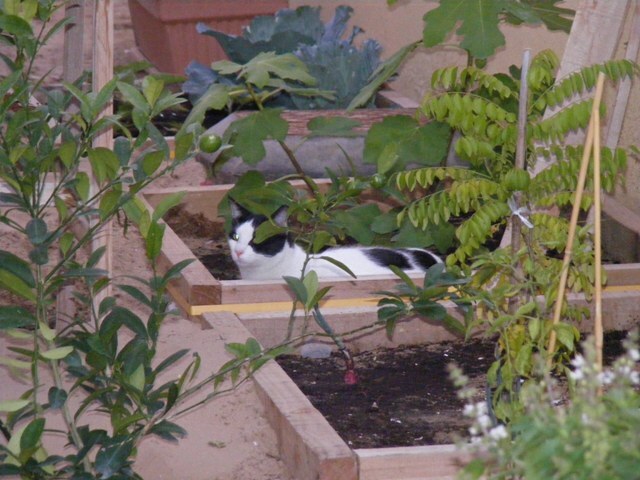 And then bits of grass is plugged into the soil/compost mix. 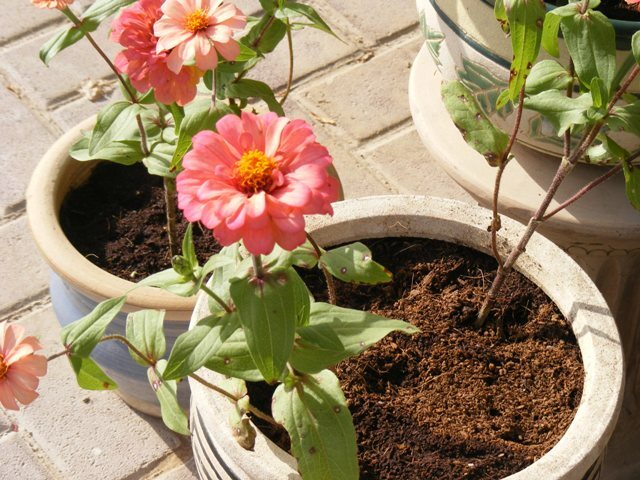 Potting soil is best used for plants in pots rather than the grass. Finally, the ground starts showing some green !! 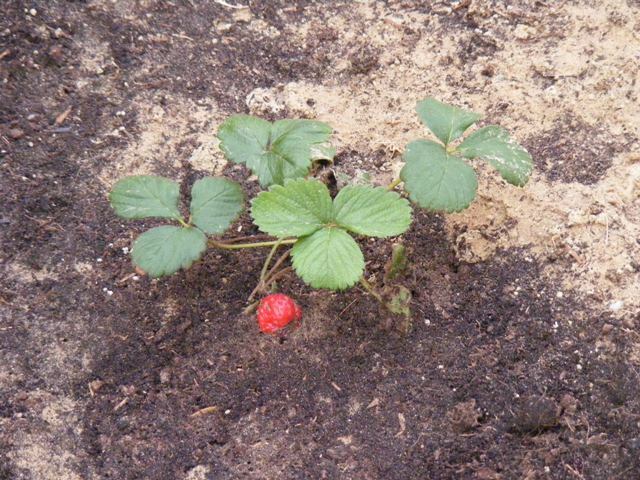 It will take nearly a month or so, before the grass roots begin to get a firm grip on the soil. The view from the other end of garden 1 looking towards the gate of the house. 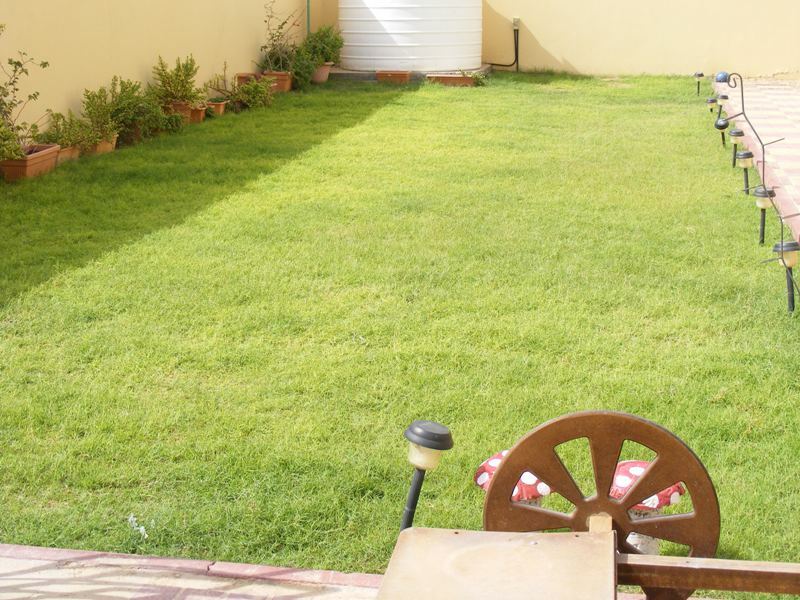 So that’s that ~~ And then we waited patiently for nearly 1 1/2 month for the grass to spread and grow ~ and it did. 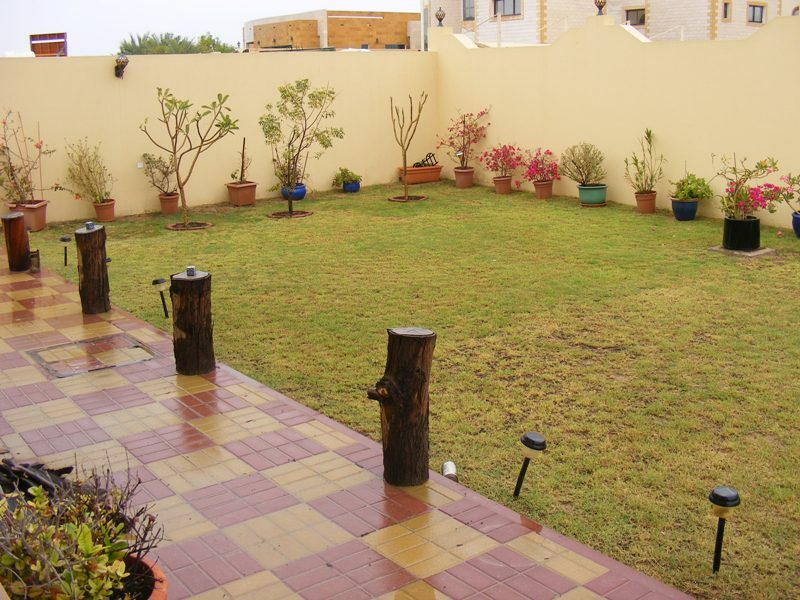 Kindly subscribe to my blog to find out the outcome of all the efforts made to bring some grassy green into our courtyard.